2 Young Somali Sisters Die After Undergoing Female Genital Mutilation : Goats and Soda The girls were ages 10 and 11 and lived in Somalia, which has the highest rate of FGM in the world. 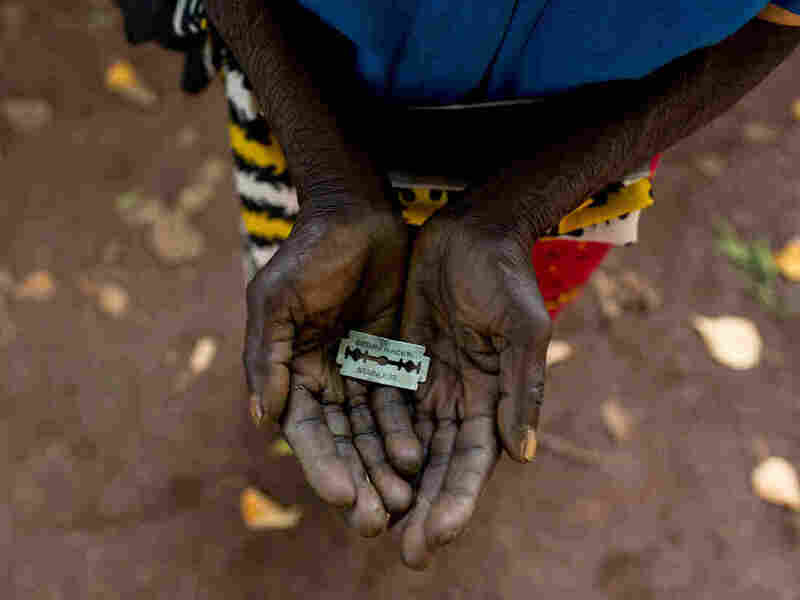 Some cutters use a razor blade for the female genital mutilation procedure. Editor's note: Given the subject this story explores, the discussion includes some explicit language. An "inexperienced self-proclaimed traditional circumciser" performed the procedure the day before, according to Dr. Mohamed Hussein Aden, director of the University Teaching Hospital in Galkayo, Somalia, who sent an email with his comments to NPR. "Infibulation is the most severe form of FGM and cutting, which [can] result in the death of the girl," Cappa says. The cases underscore concerns about FGM in Somalia, which the U.N. says has the highest prevalence in the world. Ninety-eight percent of women between the ages of 15 and 49 have undergone FGM. The practice is legal in Somalia. Worldwide, UNICEF estimates that more than 200 million women and girls have experienced some form of FGM. Somalia's attorney general Ahmed Ali Dahir announced that efforts would be made to prosecute the individual who performed the FGM procedure. Reuters has reported that Nuur's family hindered the investigation by withholding information. "Deeqa's family seems to have held things back as they continue to believe that FGM is not wrong," says Brendan Wynne, spokesman for Donor Direct Action, a U.S. organization that works with grassroots organizations that seek to eliminate FGM. "I believe that the AG was doing this all for press. When the cameras are not there, I doubt there is much interest in the Deeqa case or any others," Ali says. "As [a] medical community, we are dismayed, disarrayed and shocked [by the] brutal action and the cold-blooded loss of our beloved daughters," Aden writes in his email. "The cruel practice is deeply rooted and protected in our society. Believe me, we have to wage a war to eliminate it." Can A Bath Of Milk And Honey Replace Female Genital Mutilation?